LankaWeb – Can the Kremlin Finally Realize the North-South Transit Corridor? One of Vladimir Putin’s earliest proposed mega-projects—first announced on September 12, 2000—calls for the creation of a North-South transportation corridor linking Russia with the Caspian littoral states, including Iran, as well as India and Sri Lanka. Such a transit network would permit these countries to bypass the Suez Canal on the way to Europe and could become the basis for expanded Russian influence in Central and South Asia. But over the intervening 18 years, this project, like many others championed by Putin, has remained largely unfulfilled. The stumbling blocks to its realizations have included conflicts of interest among the countries it intends to unite along with the failure to complete a central link for this corridor—the railway line from Russia through Azerbaijan to Iran. Furthermore, it has been overshadowed by simultaneous efforts (Russian, Chinese and European) to develop an East-West corridor between the Pacific Rim states and Europe. Nonetheless, there are now signs that Moscow may be once again turning to this project and that it is finding a more positive response among the other countries that would have to be involved if it is to become a success. First of all, the agreement on the delimitation of the Caspian Sea by its littoral states (Russia, Azerbaijan, Turkmenistan, Kazakhstan and Iran), signed last year, has reduced many of the tensions that existed among them and made possible an expansion of Russian influence not only on the sea itself but also in the coastal countries. In turn, this has opened the way for greater cooperation between Moscow, Ashgabat, Baku and Tehran in particular for developing rail and highways that could support a North-South corridor (Politexpert.net, February 23, 2019; Windowoneurasia2.blogspot.com and, December 5, 2018). Moreover, Western sanctions on Russia—and China’s unwillingness to challenge many of them—have made trade and expanded political relations with other outcast countries like Iran even more important to Moscow. As a result, Tehran is now seeking $5 billion in credits from Moscow to develop its links to Russia’s proposed corridor, a request that Russia appears likely to meet (Moscow-baku.ru, February 20, 2019). One indication of this new tilt to the south is that the North-South corridor is now being listed as one of the 13 top priorities of the Russian government, a dramatic change from most of the last decade, when it was not mentioned at all (Moskovsky Komsomoloets, February 24). And perhaps most importantly, as far as Russia’s policies are concerned, Moscow is showing that it views the North-South corridor as integral to its involvement in the East-West one. Not only could the former be used as an extension of the latter, but such a combined approach gives the Russian authorities more options and leverage in Azerbaijan and Turkmenistan. Notably, these two Caspian countries are heavily invested in East–West oil and natural gas flows that Europe is interested in; but those flows could turn more in Russia’s direction if the North-South corridor becomes a reality. And if those Caspian-basin energy exports increasingly start passing via Russian territory, this would allow Moscow to undercut the West’s influence in these two countries as well as other parts of the Caucasus and Central Asia. Toward that goal, Russia—with Turkmenistan’s now-enthusiastic support—is actively promoting the first Caspian economic forum to be held in Ashgabat in August. The event is slated to focus on the development of transportation networks through and around the Caspian, including not just the East-West transit of hydrocarbons but the North-South corridor. The latter, importantly, will carry many other types of goods between these countries and Russia, thus helping Moscow to maintain or even expand its influence in the region (Trend.az, February 26). 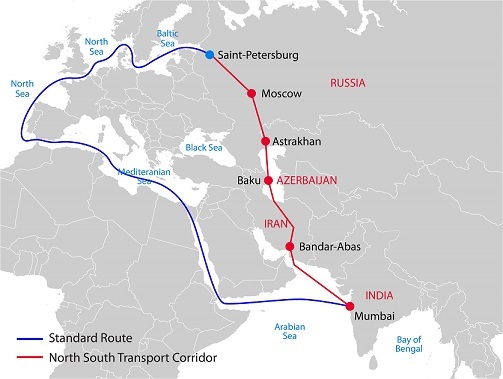 All this has led Russian commentators to suggest that the completion of the North-South corridor is likely to be fast tracked in the coming months and reemerge as an important part of Russia’s geo-economic and geopolitical policies (Casp-geo.ru, February 22). But the proximate cause of this boomlet” of attention may not be from the above-mentioned trends, all of which have been the subject of off-and-on discussions in Moscow and the capitals along the North-South route. Rather it is due to the increased attention this development is now receiving from another quarter—India. In early February, Indian media reported that Delhi signed a memorandum of understanding with Moscow to put the development of infrastructure for the North-South corridor on an accelerated basis, with India providing much of the funding (India Times, February 5). That would give India certain advantages relative to its competitor China and might even shift the geopolitics of the Indian Ocean littoral. Iran has already reacted: A week ago, its parliament voted to expand cooperation with Russia in a variety of areas, including nuclear energy, railroads and highways, pipelines and its Caspian port of Enzeli. All these transit links and strategic infrastructure elements can help push forward the completion of the long-talked-about North-South corridor project (Iran.ru, February 19). Of course, given how many players are involved, the difficulties of reaching agreements among them and then implementing those agreements, the possibility remains that all of this will fall apart before it is realized. But there is enough movement now, after a long period of neglect, that none of the major powers can afford to ignore the chance that the North-South corridor will be completed at last, with all the economic and political consequences that could have (see EDM, April 24, 2017; August 1, 2017; November 9, 2017). Unfortunately this is not economically feasible in peace time. This has tremendous military benefits for Russia. With a permanant Russian presence in Syria, Russia can disrupt shipping in the Suez if needed holding Western powers at risk. If this new transport corridor comes into operation, all countries invloved (except India) will benefit as goods will travel through them. Still it will have to compete with China’s CPEC through Pakistan which is far more feasible during peacetime as well. Its second military advantage for Russia is the ability to avoid the Baltics which will see some military action between Russia and NATO. On the other hand if war breaks out in the Baltics, Russia will be able to dictate terms to the West using Syria and this new roadwork. Very clever strategy but no takers outside Russia. They tried to do a similar thing in Afghanistan by the West prevented with the help of the Islamic terrorist group. China wants the same through Burma or Vietnam.